Home to the magnificent forested Ozark Mountains, vast grassy plains, and the jazzy Kansas City, the Midwestern state of Missouri packs a punch when it comes to beautiful natural landscapes, rugged mountainscapes, tranquil lakes, and outdoor recreational pursuits. From the live shows and entertainment in Branson and the Gateway Arch overlooking the Mississippi River in St. Louis to the American Jazz Museum and mouthwatering barbecue in Kansas City and the Discovery Center in Springfield, the Show-Me State has something for everyone. And that includes fantastic, family-friendly or luxurious places to stay, and here are a few of them. Snuggled deep in the magnificent Ozark Mountains of Missouri, Big Cedar Lodge is a secluded haven of beauty and tranquility that echoes a time gone by. Surrounded by an area steeped in history, this rustic resort epitomizes the American wilderness and offers guests a little slice of outback heaven. Big Cedar offers a variety of specialty lodging accommodations, ranging from cozy knotty pine cottages and log cabins in the woods to grand hillside villas with spectacular views of the glassy Table Rock Lake below. Beautifully appointed for absolute privacy, lodgings are luxuriously furnished and boast private balconies, cozy fireplaces, and modern amenities to cater for every need. Enjoy a variety of delicious fare at no less than four restaurants in the resort. Savor southern home-style food in a historical setting at The Devil’s Pool Restaurant; for fine dining and breath-taking views, head to Top of the Rock; or try Buzzard’s Bar for light meals and drinks accompanied by cowboy singing. The luxury resort offers guests the use of a full-service marina and an array of activities, such as horse-riding, fishing, golf and hiking and biking trails. 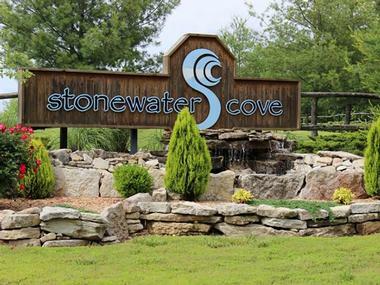 Surrounded by the Mark Twain National Forest and set along nearly 500 acres of shoreline along Table Rock Lake, Stonewater Cove is an all-inclusive, luxury wilderness resort that offers an unrivaled getaway. 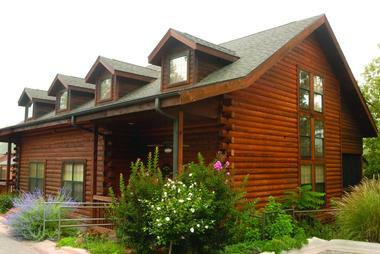 Located 15 miles from Shell Knob, the resort features rustic-chic guest rooms with en-suite bathrooms boasting rainfall showers and whirlpool tubs, living areas with pull-out sofas, private patios with breathtaking views, and modern amenities such as flat-screen televisions with cable channels, coffeemakers, and complimentary wireless Internet. Complimentary amenities include three gourmet meals a deal, snacks and non-alcoholic drinks throughout the day, and a variety of non-guided activities such as fishing, kayaking, mountain biking, and yoga. Additional facilities range from an outdoor swimming pool, hot tub and day spa, to guided fishing trips, helicopter tours, zip lining and ATV tours. 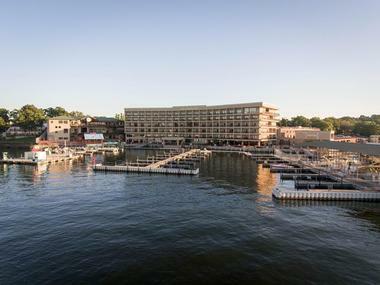 Camden on the Lake Resort, Spa, & Yacht Club is an elegant waterfront resort set on Toad Cove on the shores of Lake Ozark and features an on-site yacht club and marina, luxurious accommodations, an array of amenities and a full-service spa. Well-appointed and stylishly decorated accommodations feature spacious living areas, fully equipped kitchenettes for self-catering, modern facilities and private balconies with breathtaking views, while first-class amenities include an outdoor swimming pool with swim-up bar and hot tub, two restaurants overlooking the lake, a fully equipped fitness center, and full-service spa. The lakefront resort is ideally located to enjoy a variety of watersports with equipment rentals available including kayaking, paddle boarding, and boating and also boasts more than 19,000 square feet of sophisticated function and event space. Situated next to the Toad Cove Entertainment Complex, the Camden on the Lake Resort, Spa, & Yacht Club is ideally placed for exploring the Ozarks region with Lake of the Ozarks State Park, Osage Beach, the Osage Beach Premium Outlet Center just a short drive away. Based in a grand chateau on the shores of Table Rock Lake, the Chateau on the Lake Resort Spa and Convention Center is a lavish resort with luxurious accommodations, deluxe amenities, and breathtaking views. 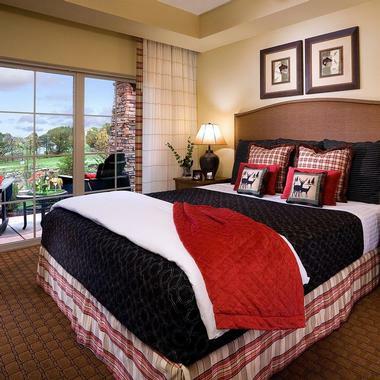 Located 7.5 miles from Branson, the plush resort features beautifully appointed and individually decorated guest rooms and suites with private bathrooms, pull-out sofas, mini-fridges, microwaves, minibars, coffeemakers, flat-screen televisions, and wireless Internet. An upscale restaurant and grill serve globally inspired cuisine, a café and wine bar offers light meals and libations, and a deli provides picnic lunches. Other resort amenities include an outdoor swimming pool, fitness center and day spa, tennis courts, boat and kayak rentals, and a full-service marina. The Chateau on the Lake Resort Spa and Convention Center also boasts over 43,000 square feet of modern meeting space. Nestled on a mountainside above the banks of Table Rock Lake, Crystal Cove Bed and Breakfast and Luxury Log Cabins is a romantic bed and breakfast-style retreat with country-chic log cabins in beautiful woodlands setting. Located a few miles from Branson and Silver Dollar City, the tranquil getaway features well-appointed, individually themed cabins with handcrafted log beds in plush linens, private bathrooms with Jacuzzi tubs, kitchenettes, and cozy fireplaces. 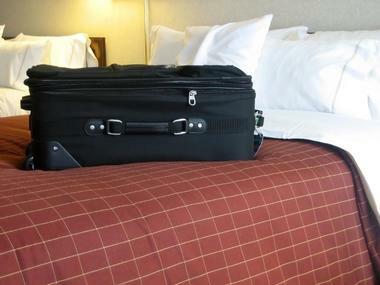 In-room amenities include flat-screen televisions with cable channels, iPod docks, coffeemakers, wine glasses, and complimentary wireless Internet. A full hot breakfast is served in the dining room every morning against a backdrop of stunning waterfall views, and additional amenities include a café serving homemade goods and drinks, a campfire area, a patio with lounge chairs for relaxing, fishing gear to use, and hiking trails to enjoy. 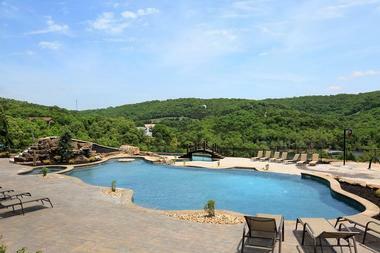 D'Monaco Resort is a luxurious vacation destination nestled in the heart of the magnificent Ozark Mountains. Resting high on a cliff overlooking tranquil Table Rock Lake in the Ozark town of Branson, the D'Monaco Resort offers spacious and stylishly decorated villas with king suites, state-of-the-art kitchens, and private verandas with sweeping views. An array of amenities at D'Monaco Resort promises to delight with a beautiful swimming pool and D'Monaco TiKi swim-up bar for lazy afternoons in the sun, a private dock on the lake for launching paddleboards and kayaks to explore the lake, and in-room massage services on request. D'Monaco Resort is set on Table Rock Lake and is ideally located for exploring the area, with the Table Rock State Park just 12 miles away. Set on the shores of the Lake of the Ozarks, the Golden Horseshoe Resort is a simple, family-owned hotel that offers a comfortable and relaxing retreat just a few miles from Lake Ozark village. The resort features an outdoor swimming pool and a grassy lawn with lounge chairs and beautiful lakeside deck with a hot tub and stunning views. Paddles boats are available to rent and enjoy on the lake, and there is a boat launch ramp for private craft. 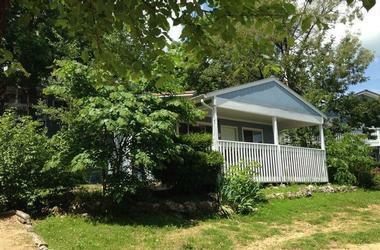 Other amenities include a coin-operated guest laundry and a games room for keeping the kids entertained on rainy days. Unfussy one and two-bedroom suites boast fully equipped kitchenettes, living areas with pull-out sofas, cable television and wireless Internet, and private patios have picnic tables and barbecue grills for alfresco dining. Located on the shores of the beautiful Table Rock Lake, 20 miles outside Branson in the Ozark Mountains, the Holiday Inn Club Vacations Ozark Mountain Resort offers a fantastic family outdoor escape. A wealth of activities is available for the whole family to enjoy from canoe, kayak and pedal boat rentals and a fishing pier with a boat launch and slips to sports courts and outdoor activities such as hiking and mountain biking. There is also a nine-hole mini golf course, basketball, tennis and shuffleboard courts, sand volleyball, tetherball and horseshoes, a playground nature trail, a movie theater, and an arcade and pool table. 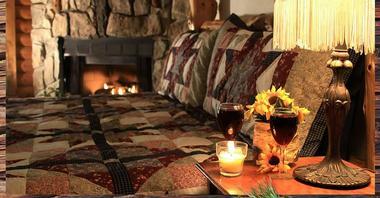 Lakeview Resort is a nostalgic retreat overlooking Davey Hollow Cove that has survived the transitions of time. Owned and operated by the Drake family since 1946, this family-friendly resort is set on the shores of Sunrise Beach in Missouri and offers an idyllic lakeside escape from the city. The resort’s grounds include three beautiful peninsulas that are surrounded by water on three sides and provides a paradise for water lovers with an array of water sports and other water-based activities. Lakeview Resort offers comfortable accommodations in the form of cozy studios and lodgings with one to six bedrooms to cater for both couples and families. Studios and residences are set on the lake shore and offer modern amenities and beautiful views. 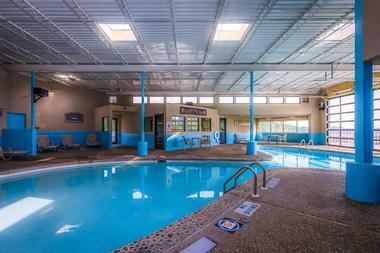 The resort offers an array of amenities ranging from three different size swimming pools, a hot tub, and sauna to a covered boat deck, a heated fishing dock and a variety of sports fields, including volleyball, shuffleboard, and hopscotch. 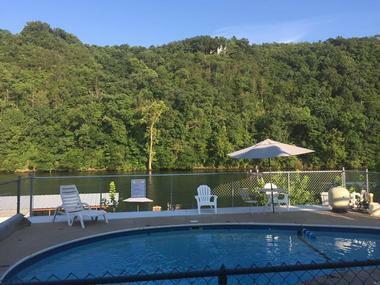 The Ozark Beach Resort is a family resort on the shores of Lake Taneycomo that offers a fun and relaxed getaway for the whole family. From comfortable accommodations with modern amenities to a large swimming pool and sun deck to fishing, boating, kayaking and more, the resort offers an idyllic escape from the hustle and bustle and the big city. Well-appointed cottages boast modern décor, fully equipped kitchens and a variety amenities, including cable television, and complimentary wireless Internet, and most of the boast beautiful lake views. Fishing boats and pontoons are available to rent, as well as boat slips for launching private craft. 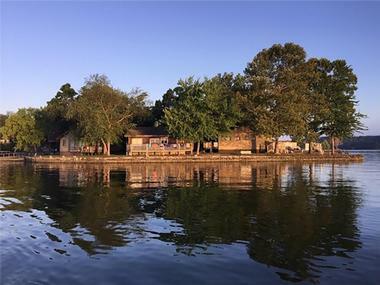 Set on the shores of Lake Taneycomo, the Ozark Trout Resort is a small resort on a beautiful waterfront property that offers a tranquil lakeside retreat for the whole family. Just two miles from the famous 76 strip, the resort is located in a quiet valley with rolling patchwork pastures on one side and a 300-foot forested bluff on the other side of the lake, making for spectacular natural scenery. The resort features simple accommodations with modern décor, fully equipped kitchens and amenities such as cable television, DVD players, and complimentary wireless Internet. 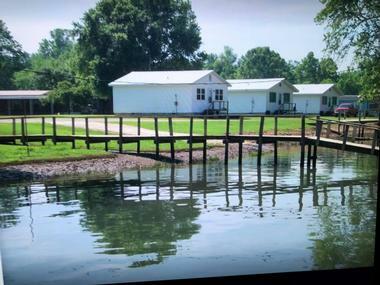 Amenities at the resort include a covered boat dock and a fishing platform, which can be used 24 hours a day, and a lake view swimming pool with a sundeck lounge chairs and shaded tables, which is ideal for soaking up the sun and the beautiful surrounding scenery. Set on the shores of the Lake of the Ozarks, the Point Randall Resort with comfortable cabin-style accommodations and a variety of activities to enjoy on the lake. Located just under five miles from Bagnell Dam and a short drive from the Lake of the Ozarks State Par, the family-friendly resort features casually decorated cottages and cabins with air-conditioning and heating, fully-equipped kitchens, fireplaces and whirlpool tubs, and patios or decks with outdoor furniture, barbecue grills, and breathtaking lake views. Set on more than 1,000 feet of shoreline along the lake, the resort offers a wealth of things to do from swimming, canoeing, kayaking, and fishing on the lake to relaxing on the sundeck by the heated outdoor swimming pool or lazing in the hot tub. The Riverwood Resort is a relaxed golf resort situated a few miles from Mount Pleasant town center that offers a variety of family-friendly amenities and comfortable accommodations. The resort features modern villas with two bedrooms and two bathrooms, fully equipped kitchens, living rooms, and outdoor patios with beautiful golf course views, along with modern amenities such as flat-screen televisions with cable channels, coffeemakers, and complimentary wireless Internet. The resort boasts 27 challenging holes of golf with a stylish clubhouse featuring a bar and grill restaurant, an on-site pro shop, and a bowling alley. Surrounded by the beautiful Ozark Mountains of Southwestern Missouri and resting on the shores of Table Rock Lake, Sky Harbor’s Table Rock Lake resort offers a tranquil getaway with spectacular natural scenery. 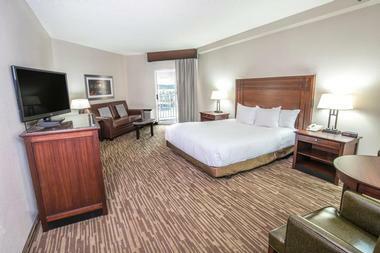 Comfortable accommodations range from one-room suites to family-sized houses, all of which have modern décor, full kitchens and dining areas, porches with barbecue grills, and modern amenities such as flat-screen televisions with cable channels, and complimentary wireless Internet. A swimming pool and heated spa overlook Table Rock Lake, two covered, lighted boat docks are available for launching private craft, and there are canoes, kayaks, and paddleboats available to rent for fun on the lake. The resort is conveniently located near Dogwood Canyon Nature Park, Persimmon Hill Berry Farm, and Branson for extra entertainment. Still Waters Resort is a deluxe lakefront resort with sophisticated, relaxed accommodations, a variety of upscale amenities, and plenty of activities for the whole family to enjoy. 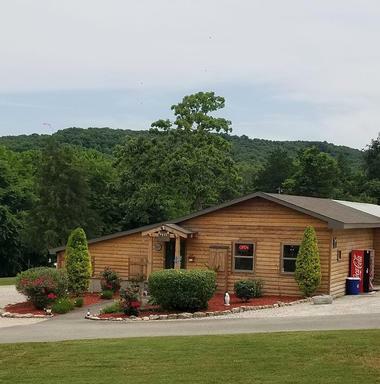 Located a short walk from Little North Indian Creek and a few miles from Silver Dollar City amusement park, the family-friendly resort features well-appointed accommodations ranging from guest rooms and condos to a private lake house. 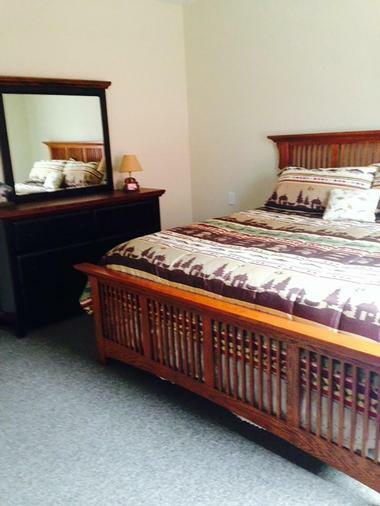 Guest rooms have mini-fridges, microwaves, and flat-screen televisions with DVD players, condos have kitchenettes, fireplaces, and jetted tubs, and the lake house has a fully-equipped kitchen and a private deck with a gas grill and beautiful lake views. Resort amenities include picnic areas with BBQ grills, outdoor swimming pools with water slides, hot tubs, a games room, and the complimentary use of bikes, kayaks, and paddleboats to enjoy. 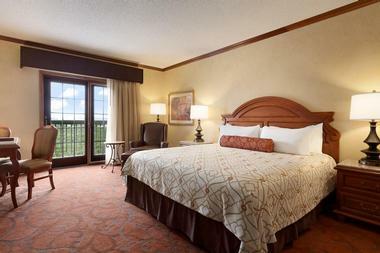 Resting on the banks of the Lake of the Ozarks in Osage Beach, Tan-Tar-A Resort is a luxurious escape from the city. Set on 420 scenic acres of beautiful terrain, the lakeside resort offers everything for an unforgettable vacation from elegant accommodations with designer furnishings and modern amenities, an array of first-class facilities and activities for all tastes and gracious service and hospitality. The resort is home to no less than eight restaurants that serve a variety of cuisine from casual fare to fine dining, a full-service day spa that provides pampering and indulgent treatments, an indoor water park that offers fun for the whole family, two championship golf courses, and full-service marina. Overlooking Lake of the Ozarks, the Lodge at Port Arrowhead is a laid-back resort with bright, basic accommodations and an array of amenities for the whole family to enjoy. Located three miles from Bagnell Dam and a short drive from Timber Falls Indoor Waterpark, the family-friendly resort features well-appointed guest rooms with private bathrooms, whirlpool tubs, mini-fridges, microwaves and coffeemakers, and complimentary wireless Internet, while upgraded suites have from family rooms with bunk beds. 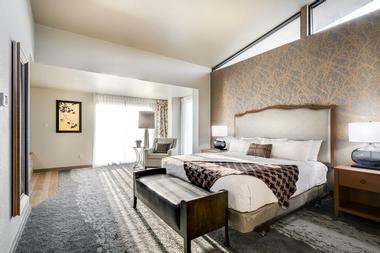 Resort amenities include indoor and outdoor swimming pools, including a cs kids' pool with a waterfall, a hot tub, a fully equipped fitness room and mini-golf course, and a restaurant with a lounge that serves breakfast, lunch, and dinner against a backdrop of beautiful lake views. Located just under 10 miles from the Lake of the Ozarks State Park, the Lodge of Four Seasons is an elegant resort set on the shores of the Lake of the Ozarks that offers a stylish lakeside getaway. The resort features sophisticated guest rooms with private bathrooms, spacious living areas, modern amenities such as flat-screen televisions with cable channels and wireless Internet, and balconies or patios with beautiful lake views. Top-rated amenities at the resort include three championship golf courses, a luxurious 15,000 square foot Asian-themed spa surrounded by lush Japanese gardens, several swimming pools flanked by wooden sundecks with lounge chairs, and a private marina with water sports rentals. A variety of dining options are available from an acclaimed restaurant serving gourmet cuisine to a seasonal farm-to-table eatery, a casual café and two cocktails bars, one of which is poolside with stunning lake views. Thousand Hills Cabin & Golf Resort is a luxury hotel and golf resort just outside of Branson and a few miles Table Rock Lake. This family-friendly country retreat offers comfortable, self-catering accommodation in the form of fully-equipped condos and cabins and an array of amenities, including a championship golf course, fitness center, and two swimming pools. Thousand Hills Hotel, Golf Resort, and Conference Center features a variety of accommodation including fully-equipped, self-catering condos and comfortable, cozy cabins set on the lake, the golf course, or in the woods. Guests at the Thousand Hills Hotel, Golf Resort, and Conference Center may take advantage the many first-class resort amenities on offer, ranging from two swimming pools – one outdoor and one indoor, tennis courts, a fully equipped fitness center, and an award-winning 18-hole championship golf course. The golf course features the largest pro shop in Branson and offers golf carts for players on the pristine course. 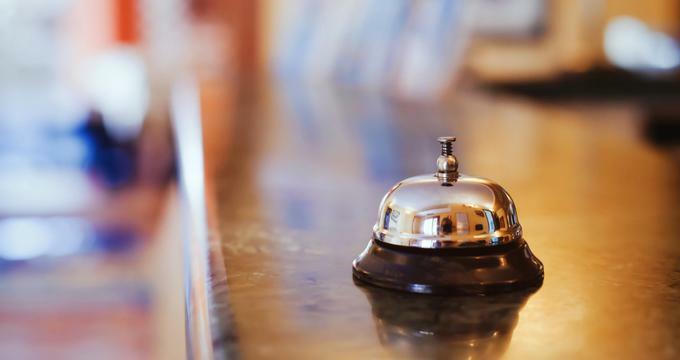 Additional guest service includes a mini-business center complete with a guest computer, printing, copying and faxing services, special flower delivery, and complimentary wireless Internet. Timber Creek Retreat House is a Spiritual Retreat Center in Drexel, just an hour outside of Kansas City that specializes in wellness and day retreats. Comfortable accommodations are provided with wooden décor and en-suite bathrooms, and wholesome gourmet meals are served family-style in the dining room. Amenities at the retreat range from a chapel for reflection and meditation, exercise, yoga and massage rooms, and complimentary yoga class for weekend guests to hiking trails through lush woodlands and rolling meadows, a library of spiritually-based books, a spiritual cinema room for inspirational films, and a gift shop selling retreat related merchandise. Resting on the shores of the Lake of the Ozarks, the Alhonna Resort & Marina is a family-owned resort that offers comfortable accommodations, and an array of amenities and activities for the whole to enjoy. 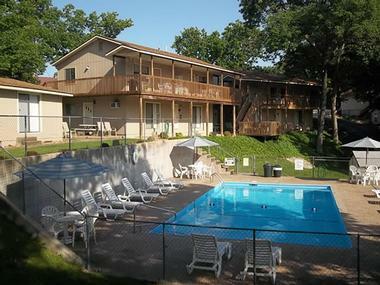 Just a short drive from Lake Ozark town and the Lake of the Ozarks State Park, the resort features simply furnished guest rooms with coffeemakers, mini fridges, and microwaves; one to four-bedroom apartments and cozy cottages with kitchens, fireplaces and private decks with stunning views. The resort provides a marina and boat slips for launching craft, indoor and outdoor swimming pools with sundecks and hot tubs, fire pits for evenings under the stars, and a casual restaurant and bar that serves globally inspired cuisine and drinks. Set on the Indian Point Peninsula that juts out into Table Rock Lake, Antler’s Resort is a family-friendly resort that offers the perfect base for exploring the region and all its attractions. 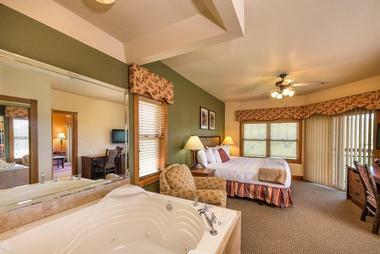 Situated a few minutes away from Silver Dollar City and a short drive from Branson, Antlers Resort features several different sized cabins with contemporary décor, private bathrooms, fully equipped kitchens, balconies or decks with charcoal grills and picnic table, and complimentary wireless Internet throughout. Amenities at Antler’s Resort include an outdoor swimming pool with a sundeck and lounge chairs, a water slide and shaded poolside picnic areas, a basketball court and games room, a fire pit, a guest laundry and a covered boat dock with boat rentals. Nestled in the breathtaking Ozarks in the heart of Branson, The Lodges at Timber Ridge is a first-class destination resort offering spacious luxury vacation lodge rentals, fine dining, and world-class live theatre entertainment. Featuring an array of deluxe amenities such as a 10,000 square foot Splash-a-Torium with a 100-foot slide, indoor and outdoor swimming pools and hot tubs, a kid’s splash zone, and plenty of deck chairs for lounging, the resort promises an unforgettable getaway for the whole family. 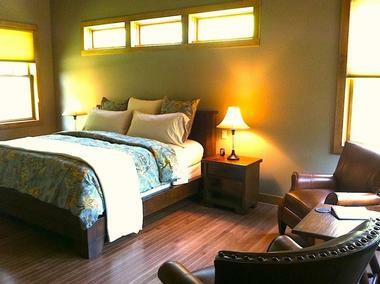 The Lodges at Timber Ridge offer spacious one-bedroom, one-bathroom cabins with stone floors, exposed beams, granite counters, and modern amenities such as sizeable wall-mounted LCD TVs, fireplaces, and complimentary wireless Internet. The onsite Stage Door Restaurant is a family-friendly eatery that serves an array of American favorites in a casual atmosphere, as well as cocktails and other beverage in a comfy lounge area. Located in the heart of Branson's beautiful Ozark Mountains and set on 140 acres of pristine woodlands, Westgate Branson Woods is a plush, laid-back resort hotel with beautifully appointed accommodations and an array of top class amenities. 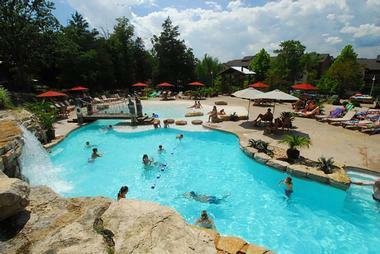 Located a few miles from the Silver Dollar City theme park and the Tanger Outlets Branson Mall, the resort features functional rooms with coffeemakers, microwaves, and mini-fridges, as well as cozy one and two-bedroom villas with full kitchens, whirlpool tubs, fireplaces, and private balconies with lovely views. Resort amenities include three outdoor swimming pools and a sand volleyball court, a casual pizzeria and bar, and several hiking trails around the property. Bikes can also be rented for exploring the area.